These highlights do not include all the information needed to use YERVOY safely and effectively. See full prescribing information for YERVOY. YERVOY, in combination with nivolumab, is indicated for the treatment of adult and pediatric patients 12 years of age and older with microsatellite instability-high (MSI-H) or mismatch repair deficient (dMMR) metastatic colorectal cancer (CRC) that has progressed following treatment with a fluoropyrimidine, oxaliplatin, and irinotecan [see Clinical Studies (14.4)]. This indication is approved under accelerated approval based on overall response rate and duration of response. Continued approval for this indication may be contingent upon verification and description of clinical benefit in confirmatory trials. • YERVOY 1 mg/kg administered as an intravenous infusion over 30 minutes, immediately following nivolumab administered on the same day, every 3 weeks for up to 4 doses or until intolerable toxicity or disease progression [see Clinical Studies (14.4)]. Review the Prescribing Information for nivolumab prior to initiation. • Do not shake product. • Inspect parenteral drug products visually for particulate matter and discoloration prior to administration. Discard vial if solution is cloudy, there is pronounced discoloration (solution may have pale-yellow color), or there is foreign particulate matter other than translucent-to-white, amorphous particles. • Allow the vials to stand at room temperature for approximately 5 minutes prior to preparation of infusion. • Withdraw the required volume of YERVOY and transfer into an intravenous bag. • Dilute with 0.9% Sodium Chloride Injection, USP or 5% Dextrose Injection, USP to prepare a diluted solution with a final concentration ranging from 1 mg/mL to 2 mg/mL. Mix diluted solution by gentle inversion. • Store the diluted solution for no more than 24 hours under refrigeration (2°C to 8°C, 36°F to 46°F) or at room temperature (20°C to 25°C, 68°F to 77°F). • Discard partially used vials or empty vials of YERVOY. • Do not mix YERVOY with, or administer as an infusion with, other medicinal products. • Flush the intravenous line with 0.9% Sodium Chloride Injection, USP or 5% Dextrose Injection, USP after each dose. • Administer diluted solution over 90 minutes through an intravenous line containing a sterile, non-pyrogenic, low-protein-binding in-line filter. Twenty-nine patients (85%) with Grade 3 to 5 enterocolitis were treated with high-dose (â‰¥40 mg prednisone equivalent per day) corticosteroids, with a median dose of 80 mg/day of prednisone or equivalent; the median duration of treatment was 16 days (ranging up to 3.2 months) followed by corticosteroid taper. Of the 28 patients with moderate enterocolitis, 46% were not treated with systemic corticosteroids, 29% were treated with <40 mg prednisone or equivalent per day for a median duration of 1.2 months, and 25% were treated with high-dose corticosteroids for a median duration of 10 days prior to corticosteroid taper. Infliximab was administered to 5 (8%) of the 62 patients with moderate, severe, or life-threatening immune-mediated enterocolitis following inadequate response to corticosteroids. Immune-mediated colitis led to permanent discontinuation of YERVOY and nivolumab in 3.2% of patients with RCC or CRC (n=666) and withholding of both YERVOY and nivolumab in 3.9% [see Dosage and Administration (2.5)]. All patients with colitis required systemic corticosteroids, including 80% who received high-dose corticosteroids (at least 40 mg prednisone equivalents per day) for a median duration of 21 days (range: 1 day to 27 months). Approximately 23% of patients with immune-mediated colitis required addition of infliximab to high-dose corticosteroids. Complete resolution occurred in 88% of patients. Two patients with RCC had recurrence of colitis after re-initiation of nivolumab with YERVOY. Immune-mediated hepatitis led to permanent discontinuation of YERVOY and nivolumab in 3.6% of patients with RCC or CRC (n=666) and withholding of both YERVOY and nivolumab in 3.5% [see Dosage and Administration (2.5)]. All patients with hepatitis required systemic corticosteroids, including 94% who received high-dose corticosteroids (at least 40 mg prednisone equivalents per day) for a median duration of 1 month (range: 1 day to 7 months). Approximately 19% of patients with immune-mediated hepatitis required addition of mycophenolic acid to high-dose corticosteroids. Complete resolution occurred in 83% of patients. No patients had recurrence of hepatitis after re-initiation of nivolumab with YERVOY or nivolumab alone. Immune-mediated rash led to permanent discontinuation or withholding of YERVOY and nivolumab in 0.5% of patients with RCC or CRC (n=666) and withholding of YERVOY and nivolumab in 2.6% of patients [see Dosage and Administration (2.5)]. All patients with immune-mediated rash required systemic corticosteroids, including 19% who received high-dose corticosteroids (at least 40 mg prednisone equivalents per day) for a median duration of 22 days (range: 1 day to 23 months). Complete resolution occurred in 66% of patients. Immune-mediated rash recurred in approximately 3% (3/98) of patients who resumed nivolumab. In patients receiving YERVOY 3 mg/kg in MDX010-20, severe to life-threatening immune-mediated endocrinopathies (requiring hospitalization, urgent medical intervention, or interfering with activities of daily living; Grade 3 to 4) occurred in 9 YERVOY-treated patients (1.8%). All 9 patients had hypopituitarism and some had additional concomitant endocrinopathies such as adrenal insufficiency, hypogonadism, and hypothyroidism. Six of the 9 patients were hospitalized for severe endocrinopathies. Moderate endocrinopathy (requiring hormone replacement or medical intervention; Grade 2) occurred in 12 patients (2.3%) and consisted of hypothyroidism, adrenal insufficiency, hypopituitarism, and 1 case each of hyperthyroidism and Cushingâ€™s syndrome. The median time to onset of moderate to severe immune-mediated endocrinopathy was 2.5 months and ranged up to 4.4 months after the initiation of YERVOY. Of the 93 patients with Grade 2 immune-mediated endocrinopathy, 74 had primary hypopituitarism (associated with one or more secondary endocrinopathy, e.g., adrenal insufficiency, hypogonadism, and hypothyroidism), 9 had primary hypothyroidism, 3 had hyperthyroidism, 3 had thyroiditis with hypo- or hyperthyroidism, 2 had hypogonadism, 1 had both hyperthyroidism and hypopituitarism, and 1 subject developed Gravesâ€™ ophthalmopathy. The median time to onset of Grade 2 immune-mediated endocrinopathy was 2.1 months (range: 9 days to 19.3 months), and 20% were reported to have resolution. Hypophysitis. Hypophysitis occurred in 4.6% (25/547) of patients with RCC and 3.4% (4/119) of patients with CRC. Median time to onset was 2.8 months (range: 1.3 months to 7.3 months) in patients with RCC and 3.7 months (range: 2.8 to 5.5 months) in patients with CRC. Hypophysitis led to permanent discontinuation or withholding of YERVOY and nivolumab in 1.2% and 2.6% of patients with RCC or CRC (n=666), respectively [see Dosage and Administration (2.5)]. Approximately 72% of patients with hypophysitis received hormone replacement therapy and 55% received high-dose corticosteroids (at least 40 mg prednisone equivalents per day) for a median duration of 13 days (range: 1 day to 1.6 months). Adrenal Insufficiency. Adrenal insufficiency occurred in 7% (41/547) of patients with RCC and 5.9% (7/119) patients with CRC. Median time to onset was 3.4 months (range: 2.0 months to 22.3 months) in RCC and 3.7 months (range: 2.5 to 13.4 months) in CRC. Adrenal insufficiency led to permanent discontinuation of YERVOY and nivolumab in 1.2% of patients with RCC or CRC (n=666) and withholding of YERVOY and nivolumab in 2.6% [see Dosage and Administration (2.5)]. Approximately 94% of patients with adrenal insufficiency received hormone replacement therapy and 27% received high-dose corticosteroids (at least 40 mg prednisone equivalents per day) for a median duration of 12 days (range: 2 days to 5.6 months). Hypothyroidism and Hyperthyroidism. Hypothyroidism or thyroiditis resulting in hypothyroidism occurred in 22% (119/547) of patients with RCC and 15% (18/119) of patients with CRC. Median time to onset was 2.2 months (range: 1 day to 21.4 months) in patients with RCC and 2.3 months (range: 22 days to 9.8 months) in patients with CRC. Of the 137 patients with RCC or CRC who developed hypothyroidism, approximately 81% of patients with RCC and 78% with CRC received levothyroxine. Type 1 Diabetes Mellitus. Diabetes occurred in 2.7% (15/547) of patients with RCC. Median time to onset was 3.2 months (range: 19 days to 16.8 months). Both YERVOY and nivolumab were withheld in 33% of patients and both were permanently discontinued in 20% of patients who developed diabetes [see Dosage and Administration (2.5)]. Immune-mediated pneumonitis, including fatal cases, can occur with nivolumab with YERVOY. Monitor patients for signs with radiographic imaging and for symptoms of pneumonitis. Administer corticosteroids at a dose of 1 to 2 mg/kg/day prednisone equivalents for moderate (Grade 2) or more severe (Grade 3-4) pneumonitis, followed by corticosteroid taper. Withhold YERVOY dosing in patients with moderate to severe signs and symptoms. Permanently discontinue YERVOY for life-threatening (Grade 4) pneumonitis [see Dosage and Administration (2.5)]. Immune-mediated pneumonitis led to permanent discontinuation of YERVOY and nivolumab in 1.8% of patients with RCC or CRC (n=666) and withholding of YERVOY and nivolumab in 1.7% [see Dosage and Administration (2.5)]. All patients with pneumonitis required systemic corticosteroids, including 92% who received high-dose corticosteroids (at least 40 mg prednisone equivalents per day) for a median duration of 19 days (range: 4 days to 3.2 months). Approximately 8% required addition of infliximab to high-dose corticosteroids. Complete resolution of pneumonitis occurred in 81% of patients. Immune-mediated nephritis can occur with nivolumab with YERVOY. Monitor patients for elevated serum creatinine prior to and periodically during treatment. Administer corticosteroids at a dose of 1 to 2 mg/kg/day prednisone equivalents followed by corticosteroid taper for life-threatening (Grade 4) increased serum creatinine. Administer corticosteroids at a dose of 0.5 to 1 mg/kg/day prednisone equivalents for moderate (Grade 2) or severe (Grade 3) increased serum creatinine, if worsening or no improvement occurs, increase dose of corticosteroids to 1 to 2 mg/kg/day prednisone equivalents. Withhold YERVOY dosing in patients with moderate to severe signs and symptoms. Permanently discontinue YERVOY for life-threatening (Grade 4) increased serum creatinine [see Dosage and Administration (2.5)]. Immune-mediated nephritis and renal dysfunction led to permanent discontinuation of YERVOY and nivolumab in 1.2% of patients with RCC or CRC (n=666) and withholding of nivolumab and YERVOY in 2.3% of patients with RCC or CRC [see Dosage and Administration (2.5)]. Approximately 78% of patients with immune-mediated nephritis and renal dysfunction received high-dose corticosteroids (at least 40 mg prednisone equivalents per day) for a median duration of 17 days (range: 1 day to 6 months). Complete resolution occurred in 63% of patients. Withhold YERVOY in patients with new-onset moderate to severe neurologic signs or symptoms and evaluate to rule out infectious or other causes of moderate to severe neurologic deterioration. If other etiologies are ruled out, administer corticosteroids at a dose of 1 to 2 mg/kg/day prednisone equivalents for patients with immune-mediated encephalitis, followed by corticosteroid taper. Permanently discontinue YERVOY for immune-mediated encephalitis [see Dosage and Administration (2.5)]. Severe infusion reactions can occur with nivolumab with YERVOY. Discontinue YERVOY in patients with severe or life-threatening infusion reactions. Interrupt or slow the rate of infusion in patients with mild or moderate infusion reactions [see Dosage and Administration (2.5)]. Monitor patients for signs or symptoms of ocular toxicity, which may include blurred vision and reduced visual acuity. Immune-mediated ocular toxicity may be associated with retinal detachment or permanent vision loss. Administer corticosteroid eye drops to patients who develop uveitis, iritis, or episcleritis. Permanently discontinue YERVOY for immune-mediated ocular disease that is unresponsive to local immunosuppressive therapy [see Dosage and Administration (2.5)]. If uveitis occurs in combination with other immune-mediated adverse reactions, consider a Vogt-Koyanagi-Harada-like syndrome, which has been observed in patients receiving YERVOY and may require treatment with systemic steroids to reduce the risk of permanent vision loss. • Immune-mediated enterocolitis/colitis [see Warnings and Precautions (5.1)]. • Immune-mediated hepatitis [see Warnings and Precautions (5.2)]. • Immune-mediated dermatitis/skin adverse reactions [see Warnings and Precautions (5.3)]. • Immune-mediated neuropathies [see Warnings and Precautions (5.4)]. • Immune-mediated endocrinopathies [see Warnings and Precautions (5.5)]. • Immune-mediated pneumonitis [see Warnings and Precautions (5.6)]. • Immune-mediated nephritis and renal dysfunction [see Warnings and Precautions (5.7)]. • Immune-mediated encephalitis [see Warnings and Precautions (5.8)]. • Infusion reactions [see Warnings and Precautions (5.9)]. • Other immune-mediated adverse reactions, including ocular manifestations [see Warnings and Precautions (5.10)]. • Embryo-fetal toxicity [see Warnings and Precautions (5.11)]. The most common laboratory abnormalities which have worsened compared to baseline in â‰¥30% of nivolumab plus YERVOY-treated patients include increased lipase, anemia, increased creatinine, increased ALT, increased AST, hyponatremia, increased amylase, and lymphopenia. Table 8 summarizes the laboratory abnormalities that occurred in greater than 15% of nivolumab plus YERVOY-treated patients. Genetically engineered mice heterozygous for CTLA-4 (CTLA-4+/âˆ’), the target for ipilimumab, appeared healthy and gave birth to healthy CTLA-4+/âˆ’ heterozygous offspring. Mated CTLA-4+/âˆ’ heterozygous mice also produced offspring deficient in CTLA-4 (homozygous negative, CTLA-4âˆ’/âˆ’). The CTLA-4âˆ’/âˆ’ homozygous negative offspring appeared healthy at birth, exhibited signs of multiorgan lymphoproliferative disease by 2 weeks of age, and all died by 3 to 4 weeks of age with massive lymphoproliferation and multiorgan tissue destruction. YERVOY was evaluated in a total of 45 pediatric patients across two clinical trials. In a dose-finding trial, 33 pediatric patients with relapsed or refractory solid tumors were evaluated. The median age was 13 years (range 2 to 21 years), and 20 patients were â‰¥12 years old. 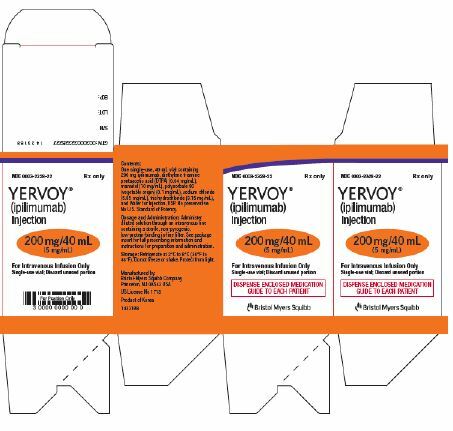 YERVOY was administered at doses of 1, 3, 5, and 10 mg/kg intravenously over 90 minutes every 3 weeks for 4 doses and then every 12 weeks thereafter until progression or treatment discontinuation. YERVOY was also evaluated in an open-label, single-arm, trial in 12 pediatric patients â‰¥12 years old (range 12 to 16 years) with previously treated or untreated, unresectable Stage 3 or 4 malignant melanoma. Patients received YERVOY 3 mg/kg (4 patients) or 10 mg/kg (8 patients) intravenously over 90 minutes every 3 weeks for 4 doses. Of the 17 patients â‰¥12 years of age with melanoma treated with YERVOY across both studies, two patients experienced objective responses including one partial response that was sustained for 16 months. There were no responses in patients with non-melanoma solid tumors. Renal Impairment: The effect of renal impairment on the CL of ipilimumab was evaluated in patients with mild (GFR <90 and â‰¥60 mL/min/1.73 m2; n=349), moderate (GFR <60 and â‰¥30 mL/min/1.73 m2; n=82), or severe (GFR <30 and â‰¥15 mL/min/1.73 m2; n=4) renal impairment compared to patients with normal renal function (GFR â‰¥90 mL/min/1.73 m2; n=350) in population PK analyses. No clinically important differences in the CL of ipilimumab were found between patients with renal impairment and patients with normal renal function [see Use in Specific Populations (8.6)]. The safety and efficacy of YERVOY were investigated in a randomized (3:1:1), double-blind, double-dummy trial (MDX010-20, NCT00094653) that included 676 randomized patients with unresectable or metastatic melanoma previously treated with one or more of the following: aldesleukin, dacarbazine, temozolomide, fotemustine, or carboplatin. Of these 676 patients, 403 were randomized to receive YERVOY at 3 mg/kg in combination with an investigational peptide vaccine with incomplete Freundâ€™s adjuvant (gp100), 137 were randomized to receive YERVOY at 3 mg/kg, and 136 were randomized to receive gp100 as a single agent. The trial enrolled only patients with HLA-A2*0201 genotype; this HLA genotype facilitates the immune presentation of the investigational peptide vaccine. The trial excluded patients with active autoimmune disease or those receiving systemic immunosuppression for organ transplantation. YERVOY/placebo was administered at 3 mg/kg as an intravenous infusion every 3 weeks for 4 doses. Gp100/placebo was administered at a dose of 2 mg peptide by deep subcutaneous injection every 3 weeks for 4 doses. Assessment of tumor response was conducted at weeks 12 and 24, and every 3 months thereafter. Patients with evidence of objective tumor response at 12 or 24 weeks had assessment for confirmation of durability of response at 16 or 28 weeks, respectively. Of the randomized patients, 61%, 59%, and 54% in the YERVOY plus gp100, YERVOY, and gp100 arms, respectively, were men. Twenty-nine percent were â‰¥65 years of age, the median age was 57 years, 71% had M1c stage, 12% had a history of previously treated brain metastasis, 98% had ECOG performance status of 0 and 1, 23% had received aldesleukin, and 38% had elevated LDH level. Sixty-one percent of patients randomized to either YERVOY-containing arm received all 4 planned doses. The median duration of follow-up was 8.9 months. The safety and efficacy of YERVOY for the adjuvant treatment of melanoma were investigated in CA184-029 (NCT00636168), a randomized (1:1), double-blind, placebo-controlled trial in patients with resected Stage IIIA (>1 mm nodal involvement), IIIB, and IIIC (with no in-transit metastases) histologically confirmed cutaneous melanoma. Patients were randomized to receive YERVOY 10 mg/kg or placebo as an intravenous infusion every 3 weeks for 4 doses, followed by YERVOY 10 mg/kg or placebo every 12 weeks from Week 24 to Week 156 (3 years) or until documented disease recurrence or unacceptable toxicity. Enrollment required complete resection of melanoma with full lymphadenectomy within 12 weeks prior to randomization. Patients with prior therapy for melanoma, autoimmune disease, and prior or concomitant use of immunosuppressive agents were ineligible. Randomization was stratified by stage according to American Joint Committee on Cancer (AJCC) 2002 classification (Stage IIIA >1 mm nodal involvement, Stage IIIB, Stage IIIC with 1 to 3 involved lymph nodes, and Stage IIIC with â‰¥4 involved lymph nodes) and by region (North America, Europe, and Australia). The major efficacy outcome measures were independent review committee (IRC)-assessed recurrence-free survival (RFS), defined as the time between the date of randomization and the earliest date of first recurrence (local, regional, or distant metastasis) or death, and overall survival. Tumor assessment was conducted every 12 weeks for the first 3 years then every 24 weeks until distant recurrence. The median age was 61 years (range: 21 to 85) with 38% â‰¥65 years of age and 8% â‰¥75 years of age. The majority of patients were male (73%) and white (87%) and 26% and 74% of patients had a baseline KPS of 70% to 80% and 90% to 100%, respectively. A total of 119 patients were enrolled in the YERVOY plus nivolumab cohort. The median age was 58 years (range: 21 to 88), with 32% â‰¥65 years of age and 9% â‰¥75 years of age; 59% were male and 92% were white. Baseline ECOG PS was 0 (45%) or 1 (55%), and 29% were reported to have Lynch Syndrome. Across the cohort, 69% received prior treatment with a fluoropyrimidine, oxaliplatin, and irinotecan; 10%, 40%, 24%, and 15% received 1, 2, 3, or â‰¥4 prior lines of therapy for metastatic disease, respectively, and 29% had received an anti-EGFR antibody. A total of 74 patients were enrolled in the single-agent nivolumab cohort. The median age was 53 years (range: 26 to 79) with 23% â‰¥65 years of age and 5% â‰¥75 years of age, 59% were male and 88% were white. Baseline ECOG performance status was 0 (43%), 1 (55%), or 3 (1.4%), and 36% were reported to have Lynch Syndrome. Across the 74 patients, 72% received prior treatment with a fluoropyrimidine, oxaliplatin, and irinotecan; 7%, 30%, 28%, 19%, and 16% received 0, 1, 2, 3, or â‰¥4 prior lines of therapy for metastatic disease, respectively, and 42% of patients had received an anti-EGFR antibody. • Enterocolitis/Colitis: Advise patients to contact their healthcare provider immediately for diarrhea or severe abdominal pain [see Warnings and Precautions (5.1)]. • Hepatitis: Advise patients to contact their healthcare provider immediately for jaundice, severe nausea or vomiting, pain on the right side of abdomen, lethargy, or easy bruising or bleeding [see Warnings and Precautions (5.2)]. • Skin Adverse Reactions: Advise patients to contact their healthcare provider immediately for rash [see Warnings and Precautions (5.3)]. • Neuropathies: Advise patients to contact their healthcare provider immediately for neuropathies [see Warnings and Precautions (5.4)]. • Endocrinopathies: Advise patients to contact their healthcare provider immediately for signs or symptoms of hypophysitis, adrenal insufficiency, hypothyroidism, hyperthyroidism, and diabetes mellitus [see Warnings and Precautions (5.5)]. • Pneumonitis: Advise patients to contact their healthcare provider immediately for any new or worsening cough, chest pain, or shortness of breath [see Warnings and Precautions (5.6)]. • Nephritis and Renal Dysfunction: Advise patients to contact their healthcare provider immediately for signs or symptoms of nephritis including decreased urine output, blood in urine, swelling in ankles, loss of appetite, and any other symptoms of renal dysfunction [see Warnings and Precautions (5.7)]. • Encephalitis: Advise patients to contact their healthcare provider immediately for neurological signs or symptoms of encephalitis [see Warnings and Precautions (5.8)]. • Advise patients of the potential risk of infusion reaction [see Warnings and Precautions (5.9)]. 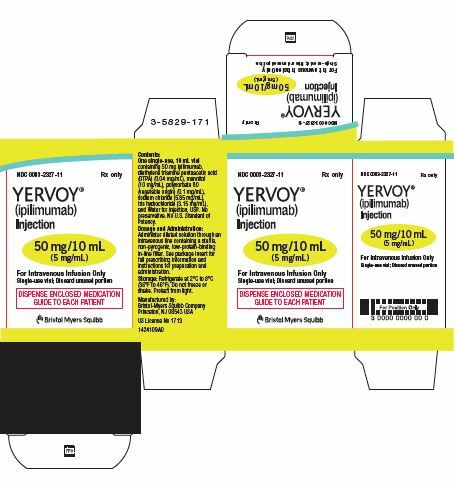 • Advise female patients that YERVOY can cause fetal harm. Advise females of reproductive potential to use effective contraception during treatment with YERVOY and for 3 months after the last dose [see Use in Specific Populations (8.3)]. • Advise female patients to contact their healthcare provider with a known or suspected pregnancy. Advise females who may have been exposed to YERVOY during pregnancy to contact Bristol-Myers Squibb at 1-800-721-5072 [see Warnings and Precautions (5.11) and Use in Specific Populations (8.1, 8.3)]. Advise patients that there is a Pregnancy Safety Surveillance Study that monitors pregnancy outcomes in women exposed to YERVOY during pregnancy, and they can be enrolled by calling 1-844-593-7869 [see Use in Specific Populations (8.1)]. • Advise women not to breastfeed during treatment with YERVOY and for 3 months after the last dose [see Use in Specific Populations (8.2)]. • in people with kidney cancer (renal cell carcinoma). YERVOY may be used in combination with nivolumab in certain people when their cancer has spread. • has spread to other parts of the body (metastatic). • You have tried treatment with a fluoropyrimidine, oxaliplatin, and irinotecan, and it did not work or is no longer working. • are pregnant or plan to become pregnant. YERVOY can harm your unborn baby. • Females who are able to become pregnant should use effective birth control during treatment with YERVOY and for 3 months after the last dose of YERVOY. • If you become pregnant or think you are pregnant, tell your healthcare provider right away. You or your healthcare provider should contact Bristol-Myers Squibb at 1-800-721-5072 as soon as you become aware of the pregnancy. • Pregnancy Safety Surveillance Study: Females who become pregnant during treatment with YERVOY are encouraged to enroll in a Pregnancy Safety Surveillance Study. The purpose of this study is to collect information about the health of you and your baby. You or your healthcare provider can enroll you in the Pregnancy Safety Surveillance Study by calling 1-844-593-7869. • are breastfeeding or plan to breastfeed. It is not known if YERVOY passes into your breast milk. • Do not breastfeed during treatment with YERVOY and for 3 months after the last dose of YERVOY. • YERVOY alone is given to you into your vein through an intravenous (IV) line over 90 minutes. • When YERVOY is used in combination with nivolumab, nivolumab is given to you into your vein through an IV line over 30 minutes. Then YERVOY is also given through an IV over 30 minutes on the same day. • YERVOY in combination with nivolumab is usually given every 3 weeks for 4 doses. After that, nivolumab alone is usually given every 2 or 4 weeks. • Your healthcare provider will decide how many treatments you will need. • Your healthcare provider will do blood tests before starting and during treatment with YERVOY. • It is important for you to keep all appointments with your healthcare provider. Call your healthcare provider if you miss an appointment. There may be special instructions for you.